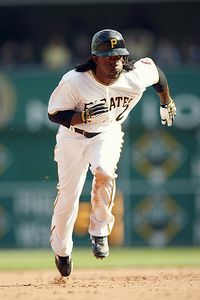 With 33 SB's on the year, McCutchen can defiently fly around the basepaths. Over on the forum, there has been a game called “Which Player Would You Rather Have?” It has really taken off, with over one hundred posted inquiries in just eight days. Basically, you pick two players that you find to have similar value, then ask which the replier would prefer to have. Whomever replies gives a name, often with a short reason, then presents the next pair to choose between. This thread has gotten me curious to one comparison in particular (which I’m not sure has been proposed, but I would be shocked if it wasn’t) is a pair of elite prospects, Colby Rasmus and Andrew McCutchen. The two have a lot in common. They were born just 60 days apart in 1986. They play the same position (center field). Both were taken in the first round of the 2005 draft–McCutchen 11th, Rasmus 28th. Both have the ability to hit for average and power, while swiping some bases. They are both capable of becoming the top player at the position. As identical as they might sound, they do have some differences. For starters, the defense has a gap. Rasmus came up and immediately posted a +9.1 UZR in center in 2009, though he regressed to a -6.5 UZR, possibly due to some nagging injuries. McCutchen, on the other hand, has been considerably worse. His -1.3 UZR in 2009 was tolerable, but 2010’a -14.4 is Adam Dunn-like ineptitude. Now McCutchen plays in a strange park with Pittsburgh, but you can only make excuses and provide hope for so long. He might improve, but he is probably just going to be Nate McLouth in center all over again (WARNING: If he gets a Gold Glove with an ugly season like McLouth, rioting will ensue). Long-term, I would expect Rasmus to stick in center no matter what, but if McCutchen continues this awful escapade, then I would expect Pittsburgh to give another player, perhaps Tabata, a chance in center. Preventing runs is a big part of baseball, but those that produce them almost always get the spotlight in the common fan’s eyes, even in this saber movement. That is where the styles of Rasmus and McCutchen are most noticeable. Colby Rasmus is the power-speed player, while Andrew McCutchen is the speed-power guy. Rasmus will never be a high-upside base stealer, and McCutchen will never be a middle-of-the-order power threat. The question is, who would you rather have there? McCutchen is likely to be the more consistent offensive commodity. He is likely to produce a solid .280-15-30 line every year, and he could reach up towards .300-20-40. He will mostly project in the first or second spot in the lineup, as he keeps a more steady OBP and can steal bases at a high rate. Rasmus is another story. Colby Rasmus will save you almost as many runs as he creates. There is more risk and reward with McCutchen’s St. Louis counterpart. While he produced a similar OBP and a higher OPS, Rasmus can be a more streaky hitter. On average, the numbers will likely sit around .275-27-15. That can have some leeway, though. His more strikeout-prone swing could see him have a season where his numbers drop to about .260-23-10. In those years, he will have to become a more efficient base stealer to keep his overall offensive game in the mix when the All-Star ballots come around. At the same time, his power and ability to get on base could give his team a line around .285-35-20. Those number won’t set the world on fire, but for a center fielder, those are great, especially if he goes back to those 2009 UZR levels. Now I’m not some psychic, nor do I like to predict statistics in baseball, because one little adjustment can lead to something where McCutchen has a great or awful year, or Rasmus could become more patient or shorten his swing and become more consistent. He could even have some crazy .300-40-30 year, but I would not bet money on it. As an overall offensive threat, give me McCutchen. This might have something to do with my being a Cubs fan, but that top-of-the-order speedster is something I crave. Having to watch the likes of Kosuke Fukudome and Ryan Theriot lead off makes me green with envy when I see a guy hitting .300 and stealing 30+ bases. So, who do I want? My answer is Rasmus.If I was talking about fantasy baseball, I would probably prefer McCutchen. He will guaranteed help you get some Hrs and SBs without risking your team’s batting average (in category leagues) or lose you points for striking out (in points leagues that penalize such things). However, I am talking about real-life baseball, where millions of dollars and World Championships are on the line. When it comes down to decision time, I want Rasmus because of his defense. Either player could be at the top of his position on offense, but that is why I want the Cards’ guy–he can do it on defense, too. McCutchen will set your team up to score. Rasmus will knock guys in and stop guys like McCutchen from getting triples by not making as many mistakes in the field. As a complete player, the Cardinals appear to have the superior talent. But, again, I am not a psychic. Don’t come crying to me if you lose money betting on Rasmus and lose! Ok, so it has been around the baseball news recently that several teams will pursue the center fielder Colby Rasmus. Well great, but guess what? He won’t be cheap. In fact, it will probably take an overwhelming package for the Cardinals to even move him in the first place. Let’s begin there, shall we? 1. 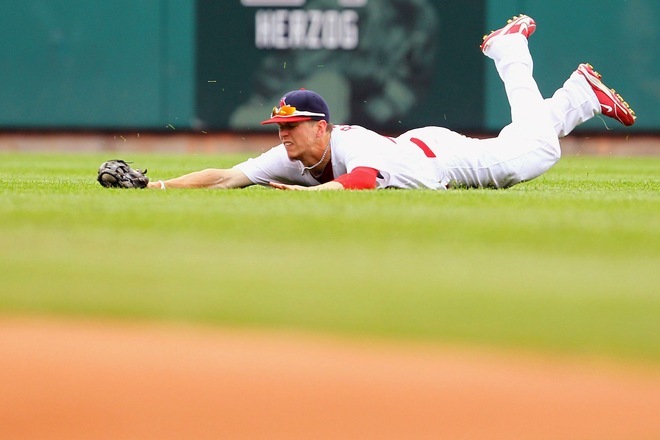 The Cardinals have no real successor to Rasmus in center field. If they move him, that just opens up another hole in a lineup that already has holes at third base, shortstop, and second base. 2. Rasmus is a cost-controlled player. This isn’t a one year or 1.5 year rental like we’ve seen with some other recent blockbuster caliber trades. he has *4* years of team control remaining with still one year to go until he reaches arbitration. What does that mean exactly? Well, it means even the small market teams with budget constraints will be in on Rasmus, thus driving the price up even more. 3. Recently, FanGraphs did a piece on players who they feel have the most trade value. Note, that isn’t a list of the best players in that order, rather they take everything into consideration (age, contract status, performance, project performance, etc). Rasmus was rated at #14, just ahead of Robinson Cano and behind David Wright. Granted, this list was made during the season and some of these can be debated, but I think for the most part, it is a pretty accurate listing. 4. My favorite, the UPSIDE. Quick, tell me one other center fielder in NL this season with a higher OPS than Colby Rasmus. Too late, The correct answer? There is none. Rasmus had the highest OPS among all center fielders in baseball this season. He turned 24 during the season and still has lots of developing to do still. Science even shows that the human brain doesn’t stop developing until the age of 25 for most males. Other center fielders to have an OPS of .850 or better at age 23/24 recently: Grady Sizemore, Carlos Beltran, Ken Griffey Jr, Jim Edmonds, Andruw Jones, and Vernon Wells. Add in the fact he is also a 5-tool player. In fact, in 2008, baseball America rated him as the #3 best prospect in all of baseball, and in 2007, had him at #5. Some people are saying well we don’t want to give up Kyle Drabek, Julio Teheran, Travis Snider, etc because they have too much upside or are untouchable or whatever the reason maybe. Well, guess what? That was Rasmus just a few years ago. Now, he has done something that a small number of super-prospects do, live up to their hype (to an extent, as I have said, still some developing to do). 5. Competition. That’s right folks, there isn’t going to be just one or two teams eying him. Even the small market teams like the Royals to the big market teams like the Red Sox will show interest in him if he is available. The sky’s the limit. Everyone can use a guy like him. Small market teams with budget problems can fit him in their plans and large markets with holes in the outfield will show interest as well. That means one very important thing: BIDDING WAR. It would be difficult to set an exact value on him because there just have not been many Rasmus-type players traded in recent memory. It is also unclear if the Cardinals would be seeking players already on a team’s MLB roster, prospects, or a mix of the two. However one thing is for sure, he won’t be cheap. I think you can get a good feel for his value with these somewhat generic proposals. In the offseason following the Yankees’ return to the top of the baseball world, the free agent hitting class lacked a sort of pizzazz (or as the bland may call it, depth). Granted, there were a few secondary names on the market (Jason Bay, Chone Figgins–both who have flamed out), along with a few surprises (Adrian Beltre’s remembering what sport this is, Marlon Byrd’s anti-Bradley impact). Whether you were in favor of the contract he got or not (I was not), Matt Holliday was the clear-cut prize among the free agent bats last winter. Holliday turned a stellar stint with the Cardinals (168 OPS+) into a ludicrous 7-year deal worth $120 million guaranteed (that can become 8/$136 million). Maybe this deal doesn’t look so puzzling in a market other than this past one, but the man had one legitimate suitor that would realistically fork over the money. The St. Louis Cardinals paid a premium for a premium talent in a not-so-premium market. Many teams were unable to spend big money, and even fewer had a desire to spend that much money on Holliday. Now, this deal has set the table for the biggest free agent hitter on the market after the 2010 season, Carl Crawford. Matt Holliday: Holliday was originally seen as a product of Coors Field, and not a whole lot more. The rugged start to his tenure in Oakland did little to quell the naysayers, and he was sent packing to St. Louis for a package centered around Brett Wallace (who was then sent to Toronto, then to Houston). That’s when it all changed. His defense was kind of rough at times (see: 2009 playoffs, 2010 All-Star game), but his bat was unquestionably destructive. What he did for the RedBirds put most of his Colorado work to shame, blasting 13 homers and rounding almost as many bases in 63 games with St. Louis (142) as he did with Oakland in 93 games (157). His .353/.419/.604 slash was monstrous, good for a 1.023 OPS. Thanks to a stellar second half after being traded to the Cardinals in 2009, Matt Holliday was able to score a mega deal with the Cardinals, despite being a part of a relatively weak free agent class. Now, in 2010, his numbers have simmered. His 168 OPS+ has dropped to 139 (his 2009 total, near his 133 career OPS+). At the time, though, he did more than enough to earn the big bucks as a free agent, and he definitely squeezed the Cardinals (who still have to worry about the Pujols negotiation) for every penny. Carl Crawford: Crawford has seen his overall numbers take a rather odd turn. His slugging is up .021 (.452 to .473), but his OBP is down .015 (.364 to .349), meaning just a .006 rise in OPS+. But one must also account for the fact that his team has been on the losing end of 2 no-hitters this season, along with the league-wide dominance of pitchers this season. Now, that Crawford’s numbers have changed is not so much odd as that a #2 hitter is putting more over the wall and stealing fewer bases (though he’s still on a 162-game pace of 53.3). According to UZR, Carl Crawford is the best defensive player in all of baseball. Crawford has kept one thing consistent, though–his stellar defense. He is by far the best fielder in the game this season, with a +22.1 UZR (yes, that’s his UZR, not his UZR/150!). It is a 9.3 drop to second place, which belongs to Cincinnati’s Jay Bruce. The second-highest UZR among left fielder is an enormous drop to Juan Pierre’s +9.4 (a 12.7 drop). So, his UZR doubles that of the next-closest competition in left. Where does all of this put Crawford in terms of a payday? It can be hard to say. On one hand, you can argue that his bat doesn’t qualify him for as big of a payday as Holliday got. While the latter has a career 133 OPS+, Crawford’s got a somewhat surprisingly low 105 OPS+ for his career (though it sits at 120 this season). His place in the batting order does keep him from hitting in a lot of RBI situations, but he scores a lot of runs. On the flip side, you have easily the best position player on the market. It just so happens he is the best fielder in baseball as well. You are getting an elite defender and base stealer, and while he may not be the masher Holliday is, he fits into either the 1- or 2-hole just fine, due to a high batting average, OBP, and buckets of steals. Either way, what he brings to the table is not the only deciding factor. Last offseason, Holliday was it. Sure, you had Jason Bay there as well, but he was older, on bad knees, and a butcher in the field (that was masked by the Green Moster, which kept his lack of range from showing). After those two, you were staring into the abyss of Mark DeRosa and Mike Cameron, two players that have fallen well short of expectations. Now, after the 2010 season, the options are much better. Crawford is still the cream of the crop, but you take a look immediately down, and you still have a dangerous Jayson Werth as a more than capable consolation prize. Even the next tier in this class is better. Some of the other outfielders available include Manny Ramirez, Aubrey Huff, Johnny Damon, Magglio Ordonez (who was hitting well before injury), Austin Kearns, and Jose Guillen. This crop of talent could keep Crawford from getting an insane deal, as could teams’ unwillingness to spend big like in the past. But with these added free agents comes an added need to fill those spots, and the list of suitors for Crawford is long. Yankees: They always have money, even when you think they don’t. Rays: Who know? Maybe they actually give out a big contract for once, since they are slashing Pena’s money from the payroll. Angels: Seen as the favorite to sign him in many circles, even with Torii Hunter and Bobby Abreu there, plus the up-and-coming Peter Bourjos. Those are just the beginning. All of these things–his production, Holliday’s production, the production of other free agents, money, and need–are all major factors in this contract. What will he get? Who knows? What should he get? I have a reasonable idea. If I am Crawford, I do not even consider taking less money than Holliday. With so many big market teams in the hunt for him (Yankees, Red Sox, Angels), Crawford should not be afraid to call a team’s bluff. Even if he were to do so and strike out with one, you have at least two other teams with deep pockets to go to. 2. 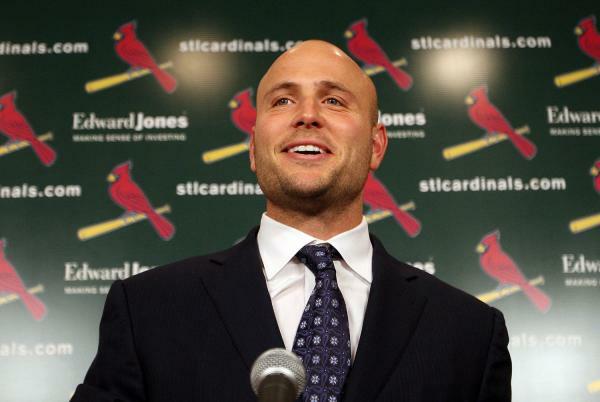 Take the same deal as Holliday–including the $17 million annual salary–and tack on another year. Make it a deal with eight guaranteed years and an option for a ninth. The deal is guaranteed eight years and $137 million, with the potential for nine years and $153 million. What’s behind door number 3? 3. Keep the same deal as option two, but without the option year. It is still a solid eight years and $136 million, more than enough to feed his family. Crawford’s camp likely would want the second option, because it guarantees the most money, but teams would likely prefer the first option, because it contains the least amount of money. So, take the middle ground and choose option three. The team gets a good hitter, a great runner, and a transcendent fielder, and Crawford gets the biggest deal any outfielder will be offered in free agency for a while. So, there it is–my first topic covered and a way Crawford gets the cheddar he deserves. This article was written on August 4th, after a game against Tampa Bay. In Twins Territory this year, there has been a lot of talk about people moving Joe (Baby Jesus) Mauer from catcher to another position. Third? Right field? Who knows. Mainly due to Mauer’s pre-All-Star Break Slump. And this year, I’ve sat in amazement as people complain about Joe Mauer. And, I’ve yet to see why. Is he hitting .365 with 28 home runs this year? No. He’ll end up around .325, with 10 home runs. Prior to tonight’s marathon game with Tampa Bay, our boy Joe is hitting .318/.387/.472. He’s second in MLB with 34 doubles, and he’s striking out less than he did last year. His batting average on balls in play is .339, And while he doesn’t possess Carl Crawford speed, he can steal a base if he needs to. Joe Mauer can do it all. And if he didn’t have to deal with the rigors of catching, he’d hit for power as well. The only problem with that, is Joe Mauer is an elite defensive catcher. The Gold Standard, of course is Yadier Molina. Yadi has thrown out almost half of would be base stealers, and holds his pitchers to an ERA of 2.99, though it should be stated his pitchers are Chris Carpenter, Adam Wainwright, and rookie sensation, Yadier Molina. Compared to Joe’s 4.30, with a rather pedestrian starting staff. Though, Yadi has had more opportunities to pick off thieves than Joe. Molina has caught 43% of thieves to Joe’s 27%. Molina is clearly better policing the bathpaths than Joe is. But, when you look at F20% (percentage of balls fielded that resulted in an out) Mauer is at a spotless 100%. Molina is at 91% (full disclosure: Mauer has had 20 chances, Molina has had 34). BF20% (percentage of bunts fielded that have resulted in an out) tells a similar story. Mauer is once again perfect, with Molina at 87%. Once again, full disclosure Mauer has had 6 chances this season, to Molina’s 15. Throughout their careers, however it still stands that Mauer is the superior fielder to Molina. Molina’s career F20% and BF20% is 88% and 80% respectively, to Mauer’s 97% and 86%. On blocking balls, they are mirror images of each other, with Mauer and Molina both having 4 passed balls and 21 wild pitches. When you look at the limited amount of catching metrics out there, Mauer and Molina are rather close when it comes to just about everything apart from preventing larceny. That is why Joe isn’t getting moved from catcher anytime soon.